Coal port gives bonuses to coal received (3 expansions: +5%; +2%; +3%). Steel port gives bonuses to steel received (3 expansions: +5%; +2%; +3%). 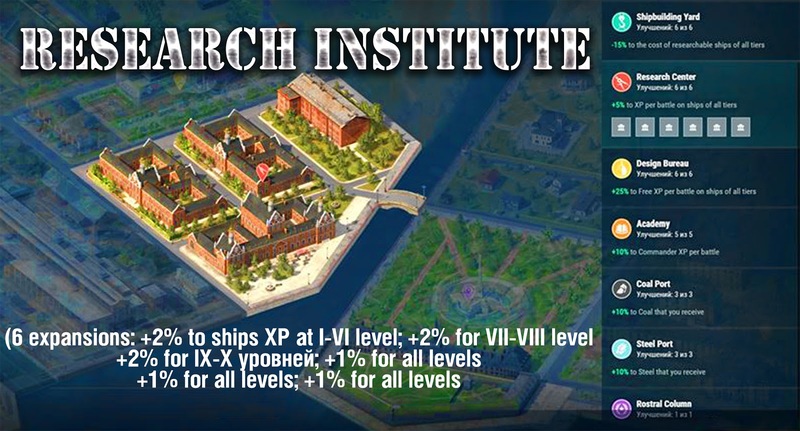 Design Bureau gives bonus to Free XP (6 expansions: +10% for I-VI level; +10% for VII-VIII level; +10% for IX-X level; +5% for all levels; +5% for all levels; +5% for all levels). 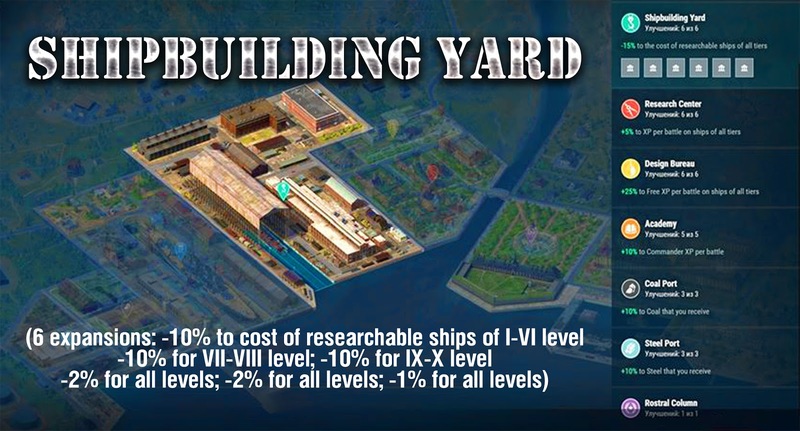 Dock is now called “Dry dock” (6 expansions: -5% to ships service at I-VI level; -5% at VII-VIII level; -5% at IX-X level; -5% for all levels; -5% for all levels; -5% for all levels). Staff is now called “Officers’ club” and has 4 expansions. Each expansion will add 5 more players to a clan. The second expansion will allow the clan to use the second rating for clan battles. 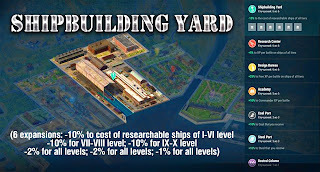 Bonuses are being added up, for example, entirely built Shipbuilding yard will give a bonus of -15% to cost of researchable ships (for any ship level). Rostral columns features stay the same. There is also voice accompaniment at the clan base now. The main goal of these changes is to make Clan base more useful and valuable for players and oil to be more demanded resource. 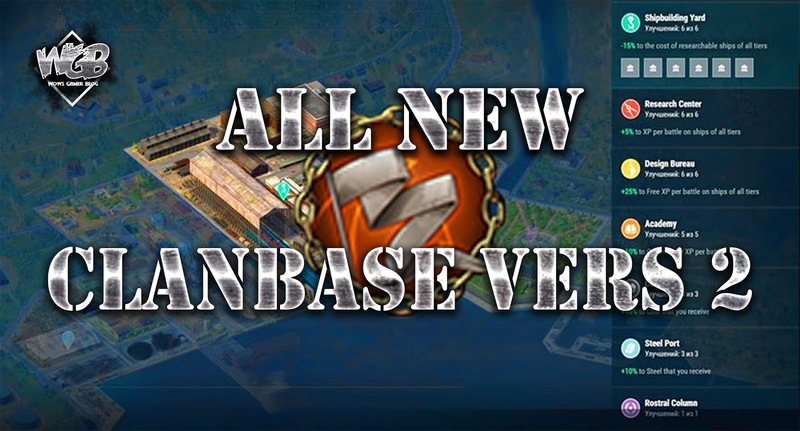 With the release of the new clan base on the main server all buildings will be destroyed, their value will be credited to oil's account of the clan. The exception will be the Staff / Officers’ club. Thus the maximum capacity of the clans will be saved. IMPORTANT! Because the Update is still being tested, the information in this Bulletin is tentative and reflects the state of game development at the time of its publication. Changes and new features may be removed entirely or implemented differently by the time the Update goes live. 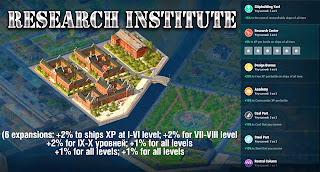 Screenshots, specific values of certain characteristics, and details of in-game mechanics will not necessarily be relevant after the Update is released.